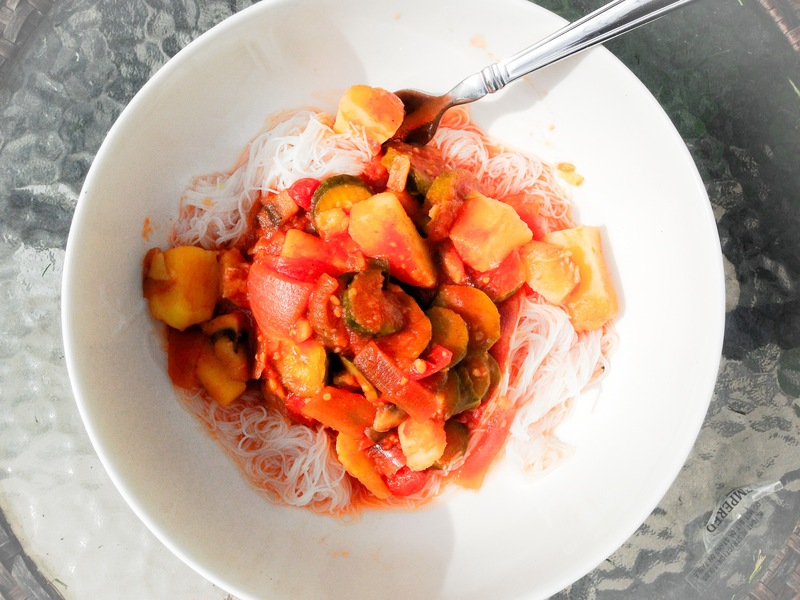 wanted to share my Sweet and Spicy rice noodle recipe with you 🙂 again, I was just kind of experimenting with tastes and ingredients and came up with this … this is a Hight Carb Low fat recipe, I don’t cook with oil and I don’t use salt in my recipes! *Note: One of the most health-promoting properties of agave nectar is its favorable glycemic profile. Its sweetness comes primarily from a complex form of fructose called inulin. Fructose is the sugar that occurs naturally in fruits and vegetables. The carbohydrate in agave nectar has a low glycemic index, which provides sweetness without the unpleasant “sugar rush” and unhealthful blood sugar spike caused by many other sugars. Agave nectar is a delicious natural sweetener that can be used moderately – by dieters, some diabetics, and health conscious cooks – to replace high-glycemic and refined sugars. – Rive noodles only take a few minutes to cook… just take your rice noodles out of the box and place them in boiling hot water for 2-3 minutes then drain and splash with cold water. follow me for more HCLF, Rt4 and vegan recipes and goodness. mmmmmmmm sounds DEE licious!!! I’ll make this (minus the Jalapeno).